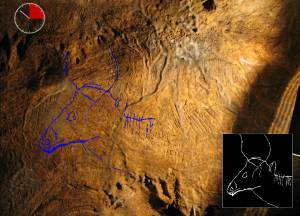 A serious game created the 100th anniversary celebration of the "Gargas caves", a prehistoric site located in France. Famous for its negative wall-paintings of hands and its overlapping engravings of animal figures, part of this cave is unfortunately no longer visitable. Indeed, public access limited to avoid the deterioration (due to lightning and or CO2 rejected by breathing visitors) of its historical treasures. This virtual version of the caves presents you with a wall rock, and cast you as scientist expert whose mission is to identify and highlight the hidden engravings representing animal figures. Besides this videogame version, we also worked on a "interactive blackboard" version of the game, which can be played in front of an audience. "Serious Games & Cultural Heritage: A case study of prehistoric caves"
Actes du colloque "15th International Conference on Virtual Systems and MultiMedia (VSMM 2009)", Vienne, Autriche, 2009. "Du jeu vidéo au serious game, approches culturelle, pragmatique et formelle"
Thèse de doctorat en science de l'information et de la communication, Université de Toulouse, 2007. Actes du colloque "Ludovia 2007" , Ax-les-Thermes, 2007.